All data in Insight can be exported in a number of formats via the download feature. In this document we'll look at the general process of exporting Insight data, then we'll examine the specific example of exporting a list of users that have directly opened a notification or rich message. Navigate to a report you would like to download. Specify file format, values, and limits. Follow steps to export specific types of report data. 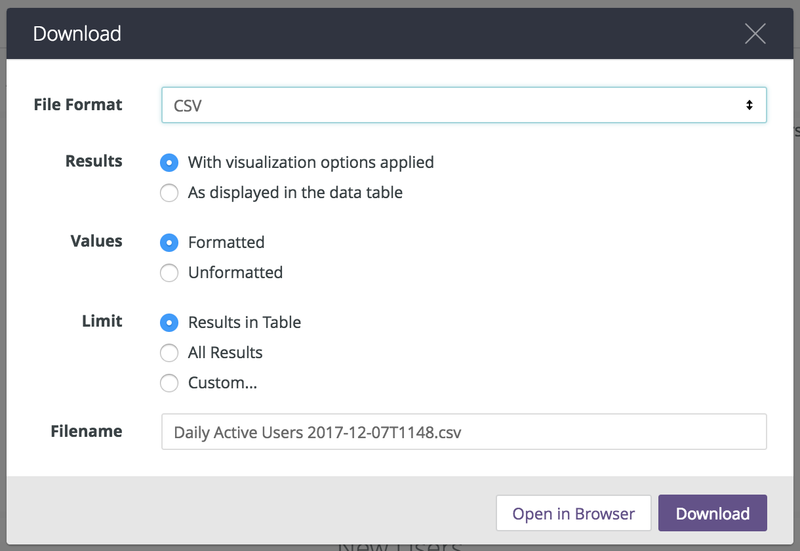 In this section we look at the general process of exporting Insight data. Navigate to the dashboard report you would like to download. File Format: The format of the download: TXT, Excel Spreadsheet, CSV, JSON, HTML, Markdown, or PNG (Image of Visualization). Results: With visualization options applied or As displayed in the data table. Values: Unformatted means special characters are truncated from values, and values will be rounded to the nearest integer, e.g., "1.13%" is rounded to "1%". As a general rule, the Unformatted option is good for discrete values, e.g., a count of devices, while Formatted is a good option for non-discrete values, such as percentages. Limit: Results in Table exports all results currently visible in the table. All Results exports every result fetched by the query. Select Custom, to define a cutoff row for the download, e.g., enter 5000 to download of the first 5,000 records. Filename: Enter a descriptive filename. Click the Download button and save the file. If you'd like to view the data in the browser instead, click the Open in Browser button, and it will open in a new browser tab. Generate a list of users that directly opened a specific push notification. In the Top 50 Notifications sent report, locate the row for the Message you want to analyze, then click its value in the Direct Open Count column. Download the data as described in Export Data. Generate a list of users that directly opened a specific rich message. In the Top 50 Rich App Pages report, locate the row for the Message you want to analyze, then click its value in the Read Count column. This configuration is necessary to ensure you capture rich message reads occurring in every timezone. Click the Run button to refresh the query. Download the data as described in Export Audience Lists. Generate a list of Ad IDs for users that made a purchase. Please visit our Ad IDs topic guide for use cases and technical details. In the Custom Events Table report, locate the purchased row, then click its value in the Custom Events column. In the window that pops up, click the Explore From Here button. In Custom Events » Dimensions, click the row for Platform. Click the Filter button for Limit Ad Tracking Enabled to add the row to the Filters menu, then set the value of is equal to to "No." Create a custom audience on Facebook. (Optional) Follow Facebook's instructions to create a Custom Audience or Lookalike Audience using the downloaded file. File must be in TXT or CSV format. You can target your audience via Audience Lists. First, follow these steps to download a CSV of device identifiers. Second, follow the steps in the Uploaded List Tutorial, using the file you just downloaded. Navigate to the Overvue dashboard. 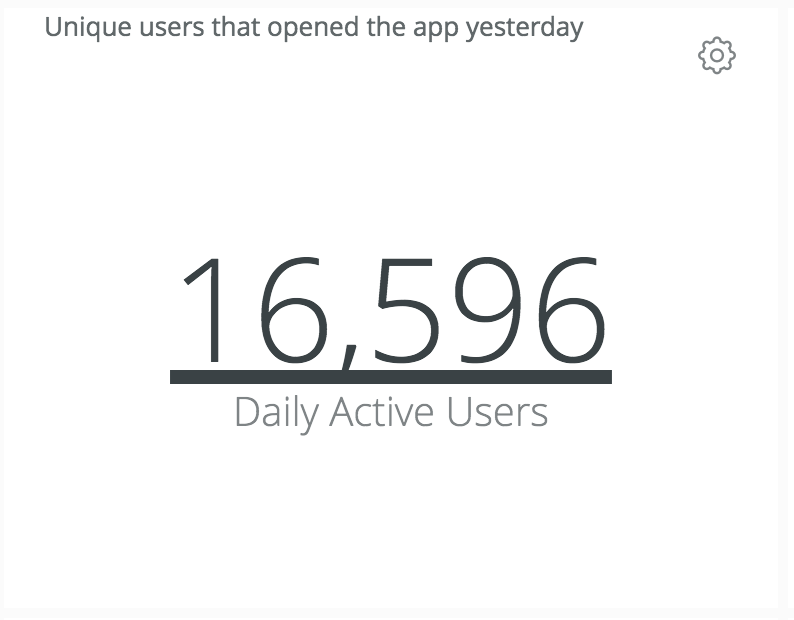 In the Daily Active Users report, click the number. In the overlay that appears, click the Explore from Here button.